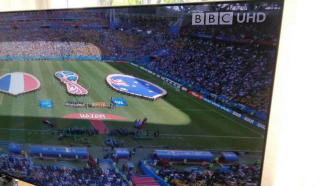 BBC's 4K iPlayer World Cup coverage gets mixed reviews | What Hi-Fi? The first 4K World Cup weekend has been and gone... so what have we (and you) made of it? The first hat-trick has been scored, the first balls have been punctured and the first weekend of the 2018 World Cup has already flown by. Of course, so has the first-ever batch of World Cup matches shown in 4K HDR on BBC iPlayer, with plenty more due to follow over the coming weeks of the tournament. Our first impressions: the picture is truly stunning. Really. We spent the weekend glued to the 4K screen and our Twitter and Facebook feeds to form our own opinion - and collect others on the matter. A tip for all you 4K football fans: turn off the goal notifications on your phone, as the iPlayer 4K stream seems a little (by which we mean a minute or more) behind the live action. It’s not the end of the world, of course, but some unfortunate 4K viewers were notified of Ronaldo’s third goal on Friday night ‘before’ he scored it. Colin Thomas, we feel your pain. We watched the France vs Australia match, and after 50 minutes of seamless viewing the sound started stuttering and commentary dropped out of sync with the picture. This was not an uncommon experience, it turns out, and many viewers resorted to BBC One HD. There have been reports of this in other matches - though in our experience, picture and sound has (mostly) matched up seamlessly. While we only experienced sync issues once during six or seven hours of 4K viewing (on a 34Mbps internet speed), others seemed to have had more persistent problems. This could have something to do with slower internet speeds but, while the BBC recommends 40Mbps for a 3840 (full 4K) experience, the company did suggest less speed would simply mean less resolution rather than stuttering. Not everyone experienced teething issues with the iPlayer 4K streams, however, and it seems there’s a strong collective cheer for the picture quality. The quickest of switches between iPlayer and BBC One HD illustrates former’s very obvious step up in sharpness, detail and colour enhancement (which only makes being forced back to HD broadcasts more painful). ...Naturally, not everyone seems to agree! Credit to the BBC, the live 4K action on iPlayer is, on the picture front at least, proving worth the wait. If, as the tournament goes by, it can iron out some inconsistencies (such as those with sound) and routinely accommodate those without super-fast broadband, this looks to be the triumphant trial it set out to be.